The drive system consists of the motor, the motor/platter linkage, and the platter. Its job is to turn the record—how simple that seems, but what a challenge it actually is. Everyone knows that the record has to be turned at a very specific speed in order to get music out of the groove. BUT, here’s the kicker what few people understand is how crucial is it that the record turn at a constant rock-solid speed. That the record may turn at, say, 33.33 r.p.m. rather than at the ideal 33 1/3 r.p.m. is less important than that it turn unwaveringly at the exact same 33.33-r.p.m. speed continuously from one instant to the next. Yes, a speed slightly off from 33 1/3 will alter the pitch a shade—turning too slow flattens the pitch, while too fast makes it sharper. But minor pitch deviation is not something to fret about greatly, providing it remains rock solid. On the other hand, speed inconstancy, where the speed rapidly fluctuates however so slightly, is far more disturbing to the music than a slightly wrong but consistent, steady speed. Inconstancy alternately causes the sound to speed up and slow down, and the musical part of your mind is incredibly sensitive to this. You may not at first consciously register the changes because they occur so quickly, but keep listening and listen with your ears, not your eyes! Consider that what makes one C note differ from another an octave higher is the rate of vibration of the string or membrane—i.e., time. Alter that time by constantly altering playback speed and you’ve altered the music. Speed inconstancy is one of the problems of mid-fi systems that leave so many people feeling bored, untouched, and unengrossed by a lot of classical music. Your brain already has a lot of sorting out to do when listening to complex music. If the music is also being frequency-modulated by speed inconstancy, then you’ll probably tire of it sometime during the first movement. The two conventionally recognized speed distortions are wow and flutter. Wow is a long-duration, low-pitch speed instability, the kind of gross distortion that’s often heard on a badly warped record. Any table that has wow is really a mess. Wow may also be caused not by the table itself but by a record warp, or a record that’s slightly out of round due to its spindle hole having been punched off-center. Check to make sure your arm and cartridge are riding nice and steady and that they’re not quivering (that’s vertical warp) or weaving slightly from side to side (the result of horizontal warp or an off-center spindle hole). Even beyond flutter, there is shimmer, what J. Peter Moncrieff of International Audio Review (IAR) calls frequency modulation, which grows directly out of what was said about speed inconstancy. Shimmer is an elusive instability or “shakiness” to the sound that’s so fundamentally intertwined with the music that often it’s most easily noted by its absence. Shimmer is the musical equivalent of gently jiggling the photo graphic enlarger during printing—it produces a soft-focus, slightly blurred effect, like draping gossamer over a camera lens. Shimmer is usually as much a matter of tiny fluctuations in the evenness of your house current as it is any outright fault of the table motor. Because of this, no matter how excellent the motor, it will always greatly benefit from a top-quality regulated power-line conditioner. The major effect of flutter and shimmer is to distort the critical time and phase relationships of the music, what’s known as time/phase distortion, which results in a loss of musical “coherence.” This means that the various sound frequencies that make up the music do not arrive at your ears in their correct order. It’s not just that speed inconstancy bends the musical notes, but that unless they reach your ear in the same exact sequence and relationships in which they were originally played and recorded, the music will have been changed. This really strains your musical mind and is one of the major causes of listener fatigue. Your ear and mind have a remarkable ability to pick up these unmusical discrepancies and be quietly freaked out by them. Time and phase coherence make up a major difference between live and canned music, and between good sound and bad. A lot of folks glibly assume that maintaining proper time relations by rotating the platter at an exact speed isn’t so hard—after all, the same kinds of motors used on quality tables are used to power clocks that keep accurate time to within seconds a year. BUT, getting the musical information out of a record groove is a physics problem totally different from getting a clock to keep good time. A platter must not “cog,” or jump from one microsecond to the next, the way a clock can ratchet from one moment to the next—the record must turn absolutely smoothly and evenly. Most people, even old folks, can easily hear sounds of 12,000 cycles per second. That means that the table motor has to be accurate to at least a twelve thousandths of a second, and if it isn’t, your ear is going to sense that. What motor for a clock has to be that accurate? A clock can vary in speed from microsecond to microsecond without this ever being noticed, whereas a platter must rotate absolutely steadily with no variation. If you could watch a clock with the same concentrated moment- to-moment attention with which you naturally listen to a piece of music, then a clock’s normal moment-to-moment speed inconstancy would be- come just as undesirable as it is with a turntable. The clock, while very accurate in its normal time-frame of minutes and hours, would no longer be accurate in the micro-time-frame of recorded music. It cannot be stressed too often how absolutely crucial a constant record speed is. Music is a uniquely temporal art form. In recognition of this, most of the top table designers have now gone to special power supplies—power line conditioners and regulators, which help enormously to lock in a steady speed and so reduce shim mer. As the minute speed variations of the motor are increasingly reduced, coherence of image and transparency become amazing. The motor of our “world class” table will require, in addition to rock-steady speed, extreme silence. All motors produce vibrations, which, if allowed to reach the stylus, will cause bad sonic problems. All mass-fi tables suffer greatly from this affiliation. Some first-rank table motors, like the Well Tempered and the Merrill, are isolated in a special sound proof housing or pod, packed with an acoustic damping material. The Well Tempered motor is further isolated on a completely separate chassis mounted atop a 12-pound block of lead. Severe motor vibration (and platter bearing noise) is known as rumble. Unfortunately, rumble doesn’t limit itself to the bass frequencies as widely supposed, but infiltrates well into the heart of the mu sic—the midrange—where it causes major sonic dislocation. This is why something as simple as putting black Linn or Merrill oil in your bearing well usually produces a striking sonic improvement. Good tables often use small clock motors because they generate less vibration than larger motors. Their lesser power is compensated for by the heavy flywheel platter. Some designers like to make a big deal about what particular kind of AC or DC motor they use. It’s not so much that one is intrinsically better than the other, but more a matter of how well a given motor is incorporated into a particular design. Since the motor’s purpose is to turn the platter, there clearly must be a connection between the two. Direct drive and belt drive are the two basic methods. Rim drive, in which the motor is connected to an idler, wheel that drives the rim of the platter, is inherently inaccurate, noisy, and obsolete—stay away! You’ll never see this on a good table anyway. A belt drive (indirect drive) table is by far the preferred choice among discerning listeners, though it is sometimes dismissed by the audio novice or mass-fi technocrat as being an “old-fashioned, low tech” design. Belt drive is a beautifully uncomplicated method that al lows money and effort to go for a high-quality motor and top-notch materials instead of being diverted to juggle a complex design, as in direct drive. With BD, the motor’s drive shaft is linked to the platter by a thin rubber belt (or in the case of the Micro-Seiki, a thin silken thread) stretching between the motor shaft pulley and the platter rim. The belt acoustically “decouples” the motor from the platter by acting as a filter and helping to dissipate motor vibration before it reaches the platter. In even the finest electric motor, the spinning rotor tends to snap back and forth between the magnetic poles, delivering its torque (power) in a series of pulses, known as cogging, rather than as a smooth even flow. When combined with the rotational inertia or flywheel effect of a heavy platter (not the flimsy hollow platters used on mass-fi tables), a belt drive smoothes out micro-vibrations and unevenness in motor rotation. Good tables use a heavy platter for two reasons. Weight provides plenty of inertial mass, which acts as a flywheel, greatly helping to smooth out platter rotation and the speed irregularities of the motor. In addition, mass also serves as a mechanical ground or sink for spurious resonances traveling up the spindle shaft and even resulting from the drag of the stylus in the groove. The sound of the stylus tracing the record produces its own nasty little distorting resonances, also called record ring. To listen for this needle talk, turn the volume completely down while playing a record and put your ear up near the table—you’ll hear a little chittering sound. Sounds cute, eh?—but it’s hell on the music. A good clamp, mat, and platter are the remedy. The best platters, when tapped, sound “dead.” Hold your ear up to the platter as you tap it with a small sharp object. The sound should be only a dull thunk, with no after-ring to it. The best “dead” platters are commonly made of a thick slab of machined plastic weighted with lead, the whole platter weighing as much as 10 pounds or more. Heavy machined-metal platters, which are the next best choice, are usually made in two parts, an inner platter and an outer ring, so that each piece will help to dampen resonances in the other. The metal is generally cast aluminum that has been milled on a lathe, as with the Linn and Acoustic Research tables, though the Source makes a beautiful heavy brass plat ter. The Rega and Systemdek tables both use a thick glass platter, which while sonically acceptable is far from our first choice of materials. Some of the top designers are now experimenting with the advantages of using machined Benelex, a super-dense material made by the Masonite company. Thin plastic or lightweight metal platters are worthless and the sure sign of a mediocre table. All platters, regardless of material, must be precision machined for level surface, roundness, and dynamic balance. The platter mat and record clamp are integral parts of what makes a good table work—these are not accessories. The designer should have figured out a good clamping method for the particular table design. However, these can sometimes be improved. George Merrill, for ex ample, thinks well of the SOTA reflex clamp for his turntable. A precision, highly polished platter bearing is essential on a heavy flywheel platter if it is to turn as smoothly and silently as possible. When you consider that an average audio system will magnify the music signal at least 30,000 times, then perhaps you can start to credit that it’s possible the sound of molecules grinding against molecules can be come incorporated into the music. There are two basic approaches to bearing design. The typical bearing is at the bottom of the platter spindle, so the platter and spindle rotate on the bearing. Very tight tolerances are essential to ensure the spindle cannot wobble in the well. This would cause horrible distortion as the platter tipped from side to side. Some bearings, as on the Linn and Merrill tables, are so exactly milled to such tight tolerances that when you insert the platter spindle in the oil-filled bearing well, the platter can take as long as a day to settle all the way down. The oil is essential in the design for several reasons. Two very smooth metal surfaces have a tendency to “freeze” together. The oil serves as a third body to keep these metals apart; It also drastically reduces friction and thereby noise and speed variation. It also helps keep the spindle centered in the well. The specific oil you use makes a small but important sonic difference. Yes, that sounds ludicrous, but try it. A few companies, such as SOTA and the Elite Rock, turn the classic bearing design upside down—the special oil-less jewel bearing sits on top of the spindle shaft instead of underneath it. This inverted bearing design is based on the premise that the best way to spin a plate (the platter) so it is very stable is to balance it on the stick (shaft) and then spin only the plate. The more conventional arrangement is to attach plate to stick and spin the stick. This upside-down design is called a fitted or zero-clearance bearing because there is no oil as a buffer layer and so contact of spindle and well is very intimate. Zero-clearance fit prevents platter wobble and ensures smooth rotation with no rattle or chatter. The materials used for spindle and well are different, preventing friction or freezing. Usually, the spindle is metal or jewel and the sleeve a polymer like Teflon or Delrin. Provided the execution is good, both designs—oil and oil-less—are probably of equal merit. It’s how the table sounds that counts. 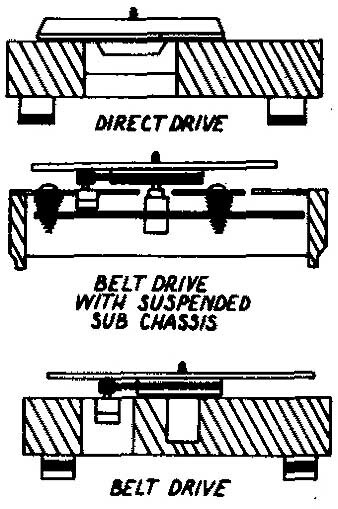 Two small disadvantages of belt drives: Speed selection on some models must be changed manually, by removing the outer platter and slipping the belt from one part of the pulley to another. It only takes a moment, but if you change speeds frequently, consider a belt drive that has pushbutton speed selection, like the Merrill or SOTA. The other minor inconvenience is low torque. Because there’s no rigid connection between the motor and platter, it’s impossible to apply the large amount of starting torque that’s needed to accelerate the platter quickly. Getting up to speed can take a few seconds because only the friction of the belt turns the platter. But why be so impatient? The low torque can be a real inconvenience, though, when using certain record cleaning brushes that can put enough drag on the platter to stall it. The delicate carbon-fiber brushes will hardly ever do this, however. Direct drive (DD), although the most common design in turn tables, is used in very few good ones. Unless you want to get involved with one of the handful of high-end DD tables, we recommend steering clear of them entirely. The good DD tables start in the $2,000-plus range with the Goldmund Studietto (incidentally, the highly vaunted $14,000-plus Goldmund Reference, the firm’s ne plus ultra, is a belt-drive), the Mitch Cotter, and the Technics SP-10 DD. Mass-market DD tables should be avoided like the plague, even the fancier, more expensive ones like Denon’s, though the boys in the white lab coats won’t be happy about this. 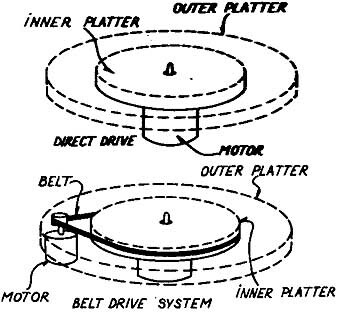 In a DD turntable, the platter is directly coupled to the electric motor—in other words, the motor’s drive shaft is the platter’s spindle and directly drives the platter. On the face of it, this would seem to be an eminently sensible drive system, the rigid coupling allowing no play between motor and platter, thereby providing very stable platter rotation, at least in theory. BUT, in execution there are some major drawbacks to this design. The DD claim for more-stable platter rotation is based on the flawed premise that a motor will turn perfectly smoothly, evenly, and exactly. Even the most expensive motors do not turn perfectly. (Check earlier remarks on speed inconstancy). As mentioned earlier, a motor’s spinning rotor tends to snap some what in its progression from pole to pole, delivering its torque (power) in a stream of rapid cogging pulses rather than a smooth even flow. Without benefit of a belt to act as a filter and isolate the platter, all DD motor vibrations are transmitted directly into the platter. So in contrast to its seeming simplicity and straightforwardness, direct drive actually requires complicated sensors and servo-control circuitry to compensate for this cogging and its associated vibration. Good direct-drive motors—those used on $2,000-plus tables—employ complex control electronics, a precision-machined rotor, and elaborately interleaved copper windings. These motors are understandably far more expensive to manufacture than a comparable motor for a belt drive table, and are far too expensive ever to be used on any mass market DD. On top of their other problems, DD tables cannot be conveniently protected from acoustic feedback and mechanical resonances. The mo tor’ s direct coupling to the platter not only transmits all motor resonances directly to the stylus/groove interface, but in addition seriously interferes with using a sprung subchassis or other isolating suspension. Directly coupling a vibrating, cogging motor to the platter and finding some way to provide protection against resonances are the two really ugly problems with DD tables. 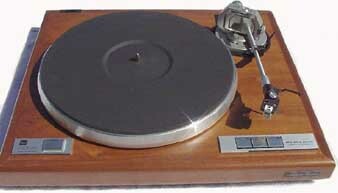 The main advantages of DD are to the mass-fi manufacturer and not to the listener, allowing a turntable to be marketed as an appliance, with “all modern conveniences”; offering almost zero setup time, in contrast to many belt-drive tables; and permitting considerable design freedom with pull-out drawers, gadgets, and twiniding lights that are fun to twiddle and nifty to look at. None of these features, however, add to fidelity of sound—the proof of the table is in the listening and nowhere else.